12-Piece Wooden Engines Set Just $19.99! Down From $45! You are here: Home / Great Deals / Amazon Deals / 12-Piece Wooden Engines Set Just $19.99! Down From $45! Check out this 12-Piece Wooden Engines Set which is on sale at Amazon for just $19.99 down from $44.99 PLUS FREE shipping with Amazon Prime or for orders over $25! If you’re looking for a Christmas present to give to your kids then take a look at this cute wooden engines set! 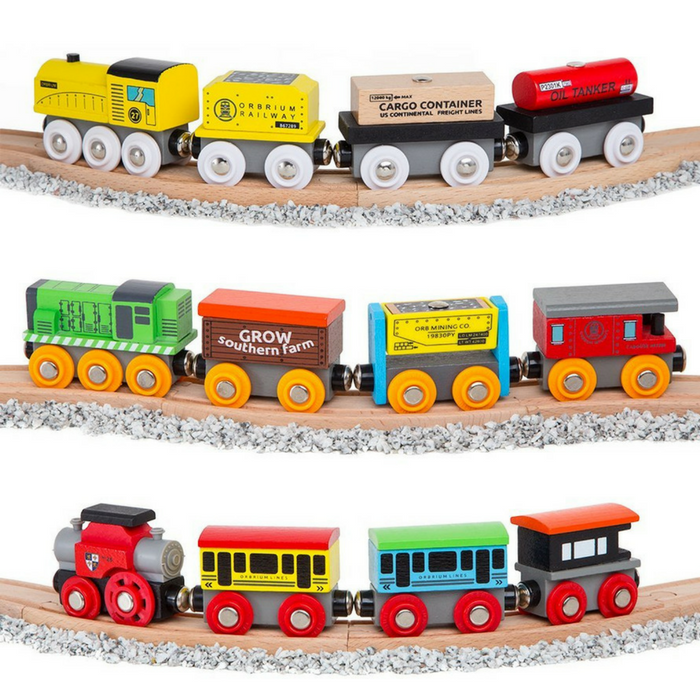 It comes in beautiful display wooden frame and fits all major wooden train play system. I’m sure your kids are gonna love it! A great collection of engines and train cars by Orbrium Toys. Set includes engines, tender, coaches, convertible coach/hopper car, cargo car, magnetic cargo load, tanker car, magnetic tanker load, hopper car, and cabooses. Comes in beautiful display wooden frame. Fits all major wooden train play systems. Conforms to the safety requirements of ASTM F963 and CPSIA.